Well that didn't last long; the good times didn't even make it through the first week of October! The selloff on Thursday and Friday put a dent in our current rally. We're definitely seeing weakness in the more specialized indexes (Nasdaq for technology or the Russell 2000 for small caps). Two signal changes this week, but the overall market outlook remains in an uptrend for now. A shift to a downtrend signal from either price/volume or OEW would put 2/3 signals in the red and shift the market outlook from uptrend to downtrend. But the S&P is still within the April/May price channel and hasn't broken key support levels, so the uptrend isn't finished...yet. 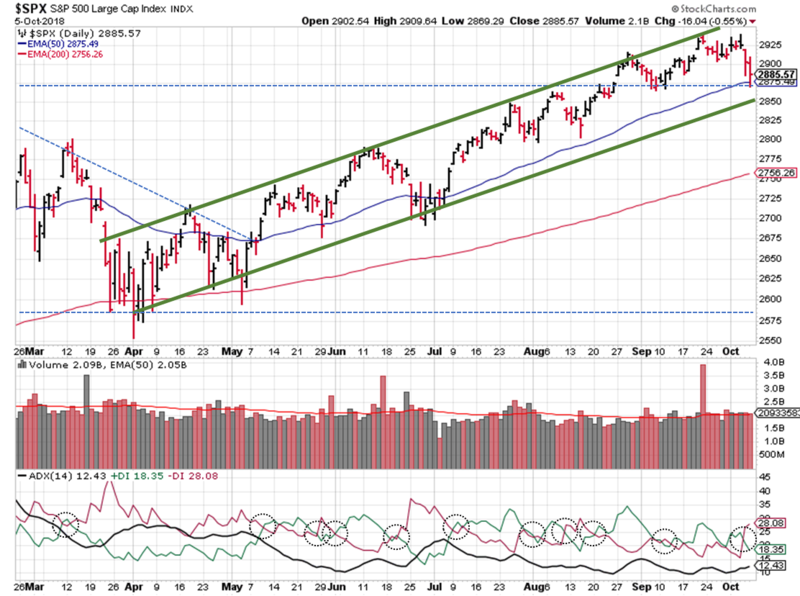 The Nasdaq followed the Russell 2000 lower, falling below it's 50-day moving average. The NYSE sits just below its own 50 day. The S&P500 sits between the 20 and the 50, having found some support at the latter. Only the Dow Jones is above it's 20 and 50. With 3 of the 5 market averages below their 20 and 50-day moving averages, the moving average signal changes to a downtrend. From a price/volume perspective, we're no longer in an outright uptrend or downtrend. 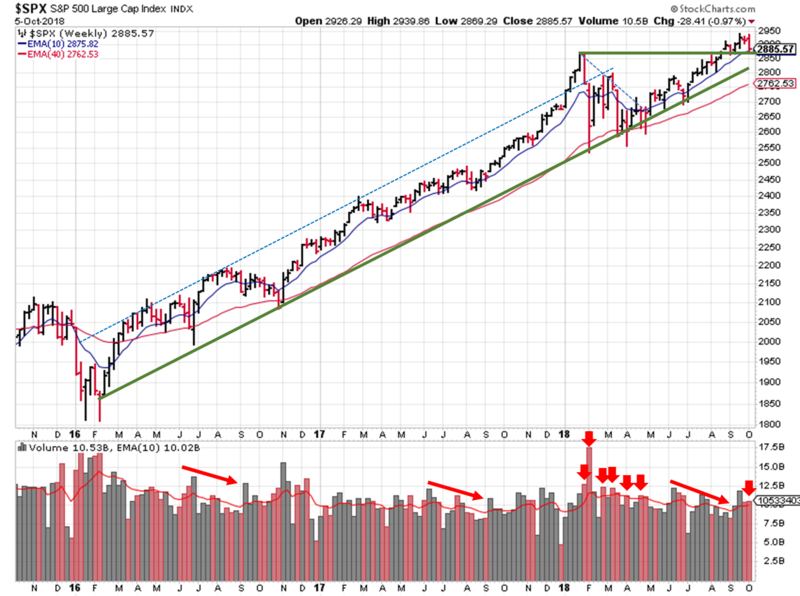 A few indexes are below their 50 days, and the distribution day count remains elevated. Specifically for the S&P, price is still above the 50-day, and distribution days are low. So this signal shifts from uptrend to mixed. Continuing last week's theme, OEW says we're in the last innings of an uptrend, expecting one last gasp to higher highs before a true correction takes hold. The S&P ($SPX) continued to retreat from the price upper channel, but appeared to find support on Friday, after testing key support levels (both the January high and 50-day moving average). If we continue lower this week, the next stop is the lower price channel. The ADX continues to meander around under the "20" level. The DI- overtook the DI+ after the late week sell off, but still no definitive signal either way. Longer term, we'll see whether institutions think it's a good time to add to their positions, or if it's time to reallocate now that they're back to the January high. Profit taking was the name of the game last week; hopefully you were able to do some of your own. 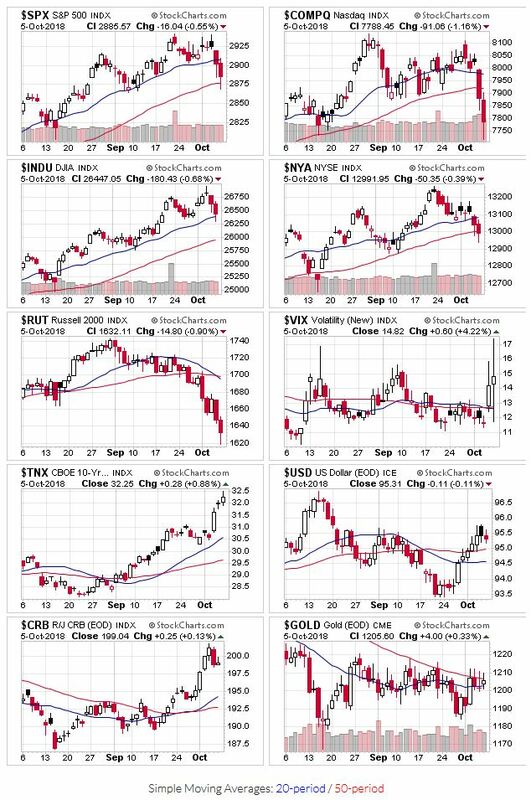 Leading stocks got hammered across the board; some were sitting on comfortable gains, others recently broke out and weren't so lucky. Use the market outlook as a guide; right now it's telling us to be cautious. Price is the ultimate decision maker, and don't forget to set stops and limit your losses if price action is weak.